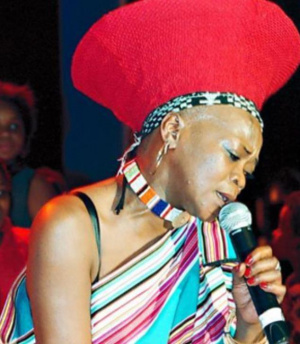 Brenda Fassie (born Brenda Nokuzola Fassie 3 November 1964 – 9 May 2004) was a South African anti-apartheid Afropop singer. Affectionately called MaBrrr by her fans, she was sometimes described as the "Queen of African Pop" or the "Madonna of The Townships" or simply as The Black Madonna. Her bold stage antics earned a reputation for "outrageousness". Brenda was born Brenda Nokuzola Fassie on November 3, 1964 in the township of Langa, Cape Town in the Western Cape province of South Africa. She was the youngest of nine children. She was named after the American singer Brenda Lee. Her father died when she was two, and with the help of her mother, a pianist, she started earning money by singing for tourists. On the morning of 26 April 2004, Fassie collapsed at her home in Buccleuch, Gauteng, and was admitted into a hospital in Sunninghill. The press were told that she had suffered cardiac arrest, but later reported that she had slipped into a coma brought on by an asthma attack. The post-mortem report revealed that she had taken an overdose of cocaine on the night of her collapse, and this was the cause of her coma. She stopped breathing and suffered brain damage from lack of oxygen. Fassie was visited in the hospital by Nelson Mandela, Winnie Mandela, and Thabo Mbeki, and her condition was front-page news in South African papers. She died aged 39 on 9 May 2004 in hospital without returning to consciousness after her life support machines were turned off. According to the South African Sunday Times and the managers of her music company, the post-mortem report also showed that she was HIV-positive. Her manager, Peter Snyman, denied this aspect of the report. Her family, including her long-term partner, were at her side when she died. This page was last edited on 4 November 2018, at 11:08.